A perfect way to make use of Halloween excess seeds, and a tasty way to do so. Bring two litres of salted water to a boil. 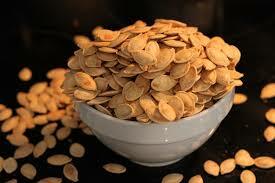 Add the pumpkin seeds to the boiling water and boil for 10 minutes. Drain the seeds and spread them out on paper towels to dry for at least 20 minutes.